This is without doubt the best general description of the dynamics of the honey bee’s social organisation. He recreates for the reader the complex infrastructure of the nest, describing the highly specialised behaviour of workers, queens, and drones, and examines the remarkable ability of the honey bee colony to regulate its functions according to events both within and outside the nest. John B Free in his review of the volume in Science said – Masterly …. Without hesitation I recommend this book to a wide range of potential readers. ”Mark L. Winston probes the dynamics of the honey bee’s social organisation. He recreates for us the complex infrastructure of the nest, describes the highly specialised behaviour of workers, queens, and drones, and examines the remarkable ability of the honey bee colony to regulate its functions according to events within and outside the nest. 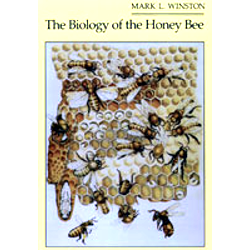 Mark Winston offers a comprehensive account, covering aspects of anatomy and physiology as well as systematics, ecology and behaviour …A useful overview of the biology of an insect that holds considerable interest for both economic and academic reasons. Rich in descriptive detail and well referenced, it will also serve as a basis for more detailed exploration of particular aspects of honey bee biology. – Sarah Corbet, Times Higher Education Supplement Winston’s writing is brisk and enthusiastic and the book’s illustrations clear and informative. This is a delightful study of an odd, yet oddly familiar, creature”. – John R. Alden, Wall Street Journal.